A number of journals and collections of letters have already been published by members of what is undoubtedly the most famous British regiment of the Napoleonic wars, the 95th Regiment of the Line (Rifles); more commonly known as the ‘95th’ or ‘the Rifles’, although the latter does ignore the fact that the regiment was not the only unit of the British Army of that time to be armed with a rifle rather than the smoothbore musket carried by most of the infantry. It does seem that the members of the 1st Battalion 95th Foot were particularly adept at keeping journals, with over half of the published journals from this three battalion regiment actually emanating from the 1st Battalion. And now another is published for the first time, some two hundred years after the events they describe. 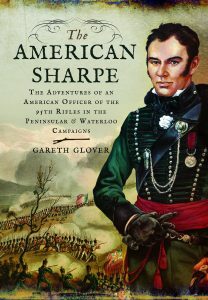 This set of journals and the accompanying letters form a fascinating and very extensive view of the life of a rifle officer, just like Bernard Cornwell’s fictitious character Richard Sharpe, but what makes them even more fascinating is that they have the added twist of the fact that the author was an American by birth! James Penman Gairdner served in the Peninsular War without a break, from the siege of Ciudad Rodrigo in January 1812 until the end of the war in 1814 and then continued with his subsequent experiences during the Waterloo campaign and the ensuing occupation of France for the next three years. He was also wounded three times during his active service. Three surviving hand written journals, written generally on a daily basis, in ink, in small leather bound pocket books have survived although occasionally, at times of heightened activity it can be seen that he has caught up with events a little later; or paradoxically during periods of acute boredom he skips rapidly over the dates. But what they do offer are truly contemporary accounts of occurrences, full of the honest description of actions he experienced and saw with his own eyes, but also with the inevitable confusions and misunderstandings of events outside of his personal knowledge. But beyond everything else, it is refreshingly untainted by the dreaded hindsight which inevitably creeps almost imperceptibly into the narratives of those who edited their journals in later years for publication. There are feint hints that at times James has revisited odd sections of the journals, but these are rare and do not materially affect the immediacy of his narrative. Despite the fact that these journals are preserved with the greatest care by the National Army Museum, at Chelsea in London, some parts of the journal have faded almost to the point that it is impossible to read the writing. Luckily I was able to obtain images of these pages with which I have used some special techniques that I have developed to draw out the little remaining ink, allowing me to transcribe them in full. It has been a high priority of mine to complete this project because it will not be long, literally months, before the ink has deteriorated beyond the possibility of ever being transcribed, particularly with reference to parts of the 1815 journal, which have certainly taxed the vision of this editor! But a very interesting aspect of his journals and letters is the relationship of the now fully independent Americans and their family still in the ‘Old Country’. It is clear that their relationships were still strong and in fact their loyalties remained fluid in many situations, family often being more important than country. These exchanges, particularly with his father make for very interesting reading in this regard and throw valuable light on this confusion of identity for many, including even those born in an Independent United States. It astonishes me that such valuable source material has been virtually ignored for so long and it is high time that they were published and I am very glad that I am able to do so now. The author knows of published accounts by ten members of the 95th, Private Edward Costello; Lieutenant Robert Fernyhough, Bugler William Green; Private John Harris; Captain John Kincaid; Captain Jonathan Leach; First Lieutenant George Simmons; Captain Harry Smith, Private Thomas Knight and Quarter Master William Surtees. Of these, six served in the 1st Battalion 95th Foot.